Old Purp Still Has It! 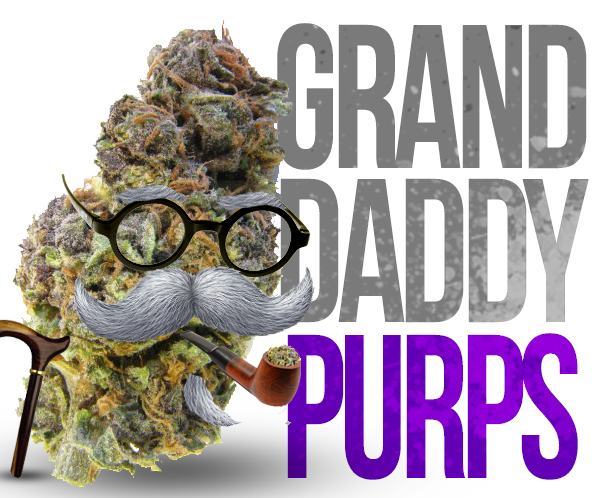 The granddaddy purple strain is a result of crossing big bud with urkel, this created a more diverse plant that is capable of producing high yields. This is an award winning strain having won the Green Cup from 2004 to 2006. This is an awesome tree for relieving pain in cancer patients and pain in general. The origins of granddaddy trace back to Northern California. Being that it’s typically grown indoors it’s a perfect fit for hydro systems. The very distinct grape taste to this bud gives it a flavorful sweet essence that lingers subtly on the tongue. The smell mirrors the taste and gets you ready for a sweet candy grape smoke. The effects of the high are balanced and smooth and this indica is surprisingly capable of giving you energy that’s great for active hobbies. The sight of this plant at its full maturity is beautiful as it reveals royal purple hues in a forest of dense green colas, definitely a veteran at providing a stimulating experience all across the board.